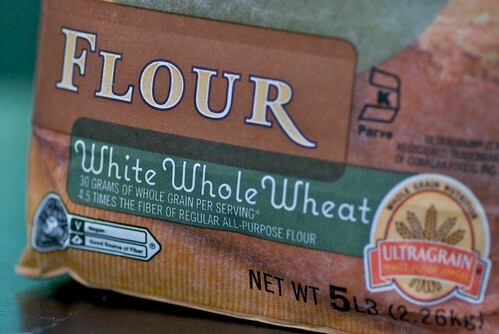 Food Blogga: What's the Difference Between Regular Whole Wheat Flour and White Whole Wheat Flour? What's the Difference Between Regular Whole Wheat Flour and White Whole Wheat Flour? Has this happened to you? You're in the baking aisle of the supermarket looking for whole wheat flour. You locate it and grab one. As you're putting it in your carriage, you notice a another bag of flour marked "white whole wheat flour." You pause and think, "What’s the Difference Between Regular Whole Wheat Flour and White Whole Wheat Flour?" Regular whole wheat flour is milled from hard red spring wheat which results in a flavorful, tan colored, high-fiber flour. It creates heavy, denser, nuttier flavored baked goods. White whole wheat flour is milled from white whole wheat, not red, which makes it lighter in color and less bitter in flavor. Yet it’s got the same nutritional value of regular whole wheat flour, which is great! It creates lighter, sweeter baked goods. Are regular whole wheat flour and white whole wheat flour interchangeable in recipes? Yes. Are white whole wheat flour and all-purpose bleached white flour interchangeable in recipes? No. Because of the difference in gluten, the texture will be affected. Start by replacing 1/3-1/2 of the all-purpose flour with the white whole wheat flour, then work your way up from there to make sure you like the texture, color, and flavor. White whole wheat flour is ideal for people who want the sweeter flavor of all-purpose bleached white flour with the nutritional punch of regular whole wheat flour. Use it in muffins, breads, scones, waffles, pizza and more. You'll be glad you did. This is awesome! I bake a lot with whole wheat flour (actually, I often use whole wheat pastry flour) but I had no idea what the difference was here. Very helpful - thank you! Great great info. I've actally always wondered how they make it white. Good to know they have the same nutritional value. Um, I TOTALLY Googled this yesterday!!! I'm actually making a dough right this second that called for "white whole wheat flour," but all I had was regular whole wheat flour. So I'm using it and hoping for the best :) Thanks for the info! I love this post! I always use white whole wheat flour when I'm baking for my parents (so they don't know it's whole wheat) but I always use regular whole wheat when I'm cooking for myself! Thanks for the info. Now, hopefully, I'll be less confused in the baking aisle. There are just way too many choices. Great post! Really informative. Thanks so much for answering my wheat questions. Thanks so much for this post. I just bought some white whole wheat flour from TJ's and I had no idea what the difference was. Love your post. I agree it can be confusing in the supermarket when looking at ingredient labels. I love using white whole wheat flour as a substitute for white wheat flour. The kids can't tell the difference and I know it's better for them. Thank you! I Googled the difference before, so I knew about the different colors of wheat used. But when I didn't learn was that the nutritional content is the same. Thanks for this very informative post, Susan. Much appreciated. So informative!I actually had no idea and great to know about the nutritional values. Thanks for explaining the difference! I bought whole wheat flour the other day and it wasn't until after I'd used it that I realized I purchased white whole wheat flour. I felt guilty thinking it had less nutritional value. Guilt be gone! Thank you for this information. It will be very helpful. It seems I learn something new on you site each time I log on. Thanks.